Glenfiddich Snow Phoenix holds a special place in my heart in the world of whiskies. Simple as that. It's one of those whiskies that if I saw it in a bar I would order it again and again. I'll probably even buy a round for everyone in the group because I just think it's that awesome a whisky. Now you may wonder why I think so highly of Snow Phoenix. 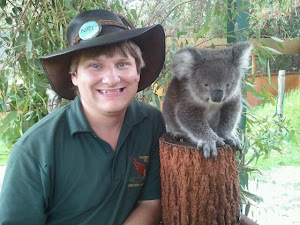 And it's for the very simple reason that both my wife and I fell in love with it in Melbourne on our Honeymoon. I've always been a whisky man, starting with the Canadian whiskies like Crown Royal and MacNaughton's. I moved off those and slowly started with the bourbons Maker's Mark and Knob Creek. Then the Irish whiskies and Scotches. Now with almost all of these whiskies I must be honest, when I first started drinking them it was always with Coke. That's right whisky and coke was my go to drink. Loved it. As I got older though I had a few times where enlightenment struck and I realized that whisky neat was better more often then not then whisky mixed. And this brings us to Melbourne. My wife and I had been married several months prior to our trip to Melbourne and we decided that we would go to Melbourne on our honeymoon in a group. That group consisting of my brother and sister in law and one of my wife's best friends. Now this was quite fortuitous for us because my brother and sister in law had been to Melbourne before and actually knew there way around and thankfully knew the way to a VERY good whisky bar. This little bar was literally a hole in the wall with no name above it, but when you went in you were immediately confronted with hundreds of whisky boxes and bottles on shelves. And once you sat down and looked at the menu there was one page for spirits other then whisky, which also included food and soft drinks and then a dozen or so pages of nothing but whisky. Whisky from all regions of Scotland, whisky from all regions of the world. Whisky as young as three years old, whisky as old as the 1940's. Brilliant, absolutely brilliant. Now we wound up going to this bar two times. The first time we tried a few different whiskies. I decided to introduce my brother in law to Crown Royal and Chivas 12 yr old which in memory had been so much better. Sadly the present was a much more disappointing place on this evening. After a lovely dinner spent at Fenix Restaurant we went to this little hole in the wall whisky bar and sat down. We perused and perused the menu again and again, looking for what might be good, trying whiskies from all over the world. Some good, some not so impressive. 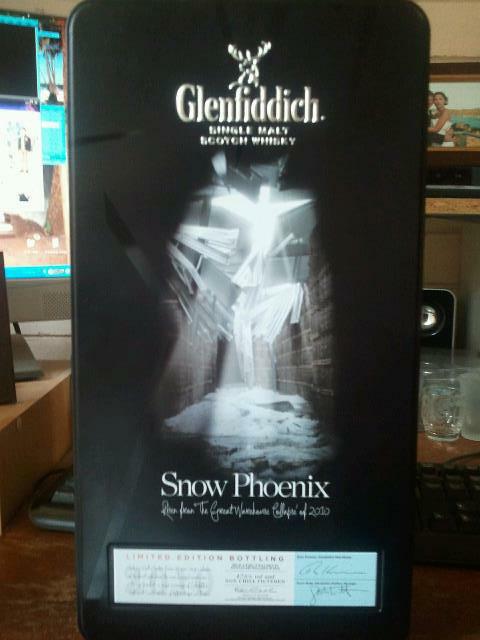 One of the whiskies that kept catching my eye was Glenfiddich Snow Phoenix. Finally we decided to order it. When it came out the aroma of apples hit my face like a batman 70's show punch. Wow! I always let my wife have the first sip of whisky so I handed the glass to here and she nosed it and immediately announced the smell of apples to her. We sat there quietly wrapped around one another nosing this glass of whisky for four or five minutes before she decided to take a sip. In this time apples had strongly announced themselves as had cinnamon, vanilla and just a hint of pear. When we decided to finally take a sip of this lovely whisky we were blown away, entirely. This was the best whisky that we had tasted all night, in fact the best whisky I'd tasted my entire life to that point. It was lovely! The flavors came through strong with honey, oak, vanilla and lots and lots of apples. My wife and I stare at this whisky in awe. The finish was so long and wonderful with oak and apples covering every part of my mouth. It was so wonderful that we decided to order another dram. At this point the rest of the group arrive at the bar so instead of just getting another dram, I get three more, one for everyone! I tell the owner of the bar that this whisky is absolutely phenomenal and I can't get enough at which point she informs me that this bottle is actually the last one in Melbourne. Everyone drinks and pronounces it excellent at which point my wife and I decided that we had to finish the bottle. So we bought seven more drams of it and stumble out of the bar several hours later very very happy. We came home a few days later and I hunt around on the net for a bottle of this awesome whisky, but am disappointed to learn that it is a limited release bottle and sadly I missed out on it. Prices for a bottle have shot up to $400 and more dollars in Australia which was out of my price range. Unbeknownst to me my wife has also been hunting a bottle of Glenfiddich Snow Phoenix and had finally managed to snag one from Abbey Whisky, a website that I had never heard about before, which wasn't too surprising since it was in the UK and at that time I had almost no idea about anything whisky, even though I thought otherwise. They had sold out of their entire stock, but she'd asked to be notified when and if they got some more in. They got some more in and informed her at which point my Christmas present was sent out. When it arrived I swear they heard me shout with joy all the way in Melbourne. This was the bottle I remembered! Even more once we cracked the bottle open the flavors and aromas that we remembered hit us once again. I now own three bottles of Snow Phoenix and hope to snag a few more before they're all gone. Since my first bottle the price on them has kept rising and rising and it, at last glance, was sitting along the lines of $250-300 AUS in the UK shops and up to $800 AUS on Ebay in Australia. If you get a chance definitely grab a dram of this awesome awesome whisky!